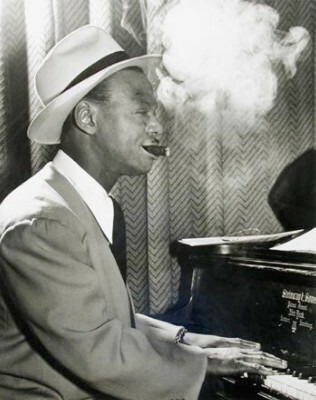 Above: Photos of Earl Hines (L) and Billy Eckstein (R). 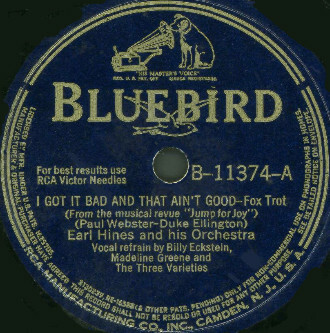 Above: Bluebird B-11374-A label, recorded on 10/28/41 in Chicago and released in November 1941. This was reissued on RCA Victor 20-2894 in 1948. Click on an option below to listen using Streaming RealAudio. Click on an option below to listen using Downloading RealAudio. Above: Photo of The Three Varieties (L-R) Leroy Harris, Willie Randall, and Budd Johnson with Madeline Greene. Above: Statement of Living Expenses made out by Madeline Greene. When was the last time you saw hotel room and board for a week in NYC total $49?